Did you know that one day the sun is just going to explode and destroy our entire world? Rick Remender does. 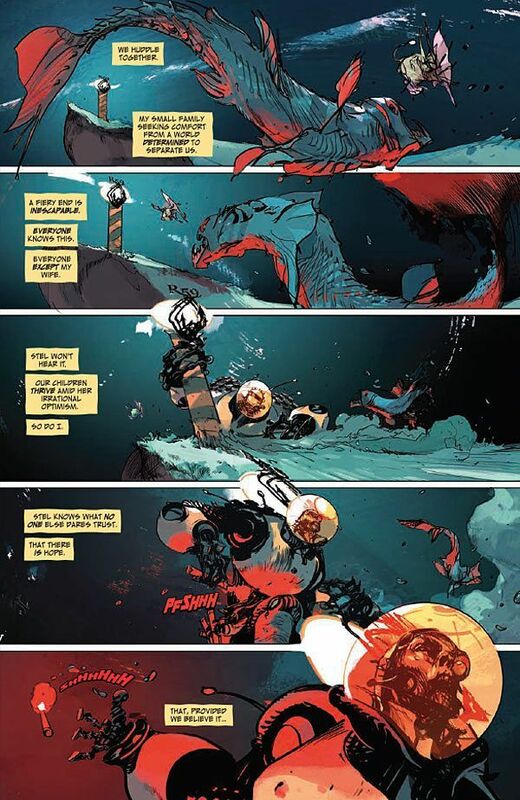 That's the basis of Low, his new comic with co-creator and artist Greg Tocchini. The book takes place in the future, where mankind has been driven deep below the ocean to escape the radiation given off by the sun as it enters its final phase of life. Seemingly any day now, it will go supernova and wipe out Earth and everything around it. Humanity is struggling to get by, hunting what they can from the oceans while searching for suitable planets out in the universe through satellites and ships sent out years ago. 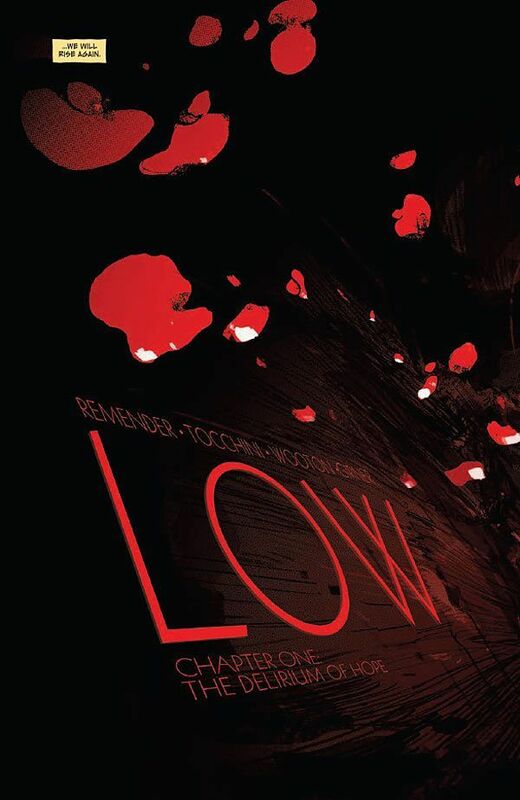 Low is an apt title for the comic as it works on many levels. The obvious angle is that these people are literally living low, as they're underwater. You can't get much lower than that. It can also refer to the overall feeling of mankind. What's the point of living or doing much of anything if the sun could explode at any moment and eliminate everything you've ever known? It's like going through life with a loaded gun held to your head. 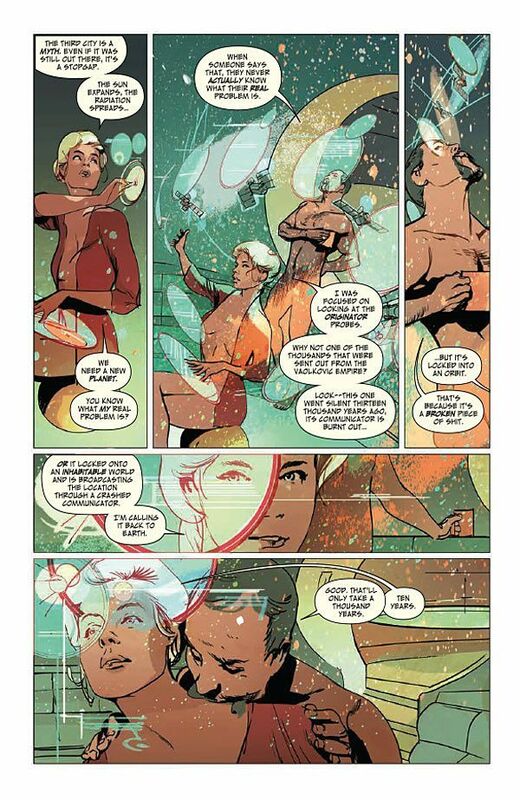 Although the overall world of Low is interesting on its own, Remender adds to it by centering on the Caine family. They're the ones responsible for gathering the food for the city using a special underwater suit that only members of their bloodline can operate. Today is a big day for Johl and Stel, as they're taking their daughters Della and Tajo out hunting for the first time. Everything seems fine until the ship gets attacked by fierce pirates. Suddenly Johl and Stel have much more to live for, even if the world is doomed. The lives of their children are at stake. The violence in this issue picks up exponentially towards the end, when the pirates descend upon Johl and his family. This comes as a bit of a shock as the bulk of the issue is very tranquil. The underwater city is beautiful. Johl and Stel have a great life together, raising their family with a sense of responsibility and honor. There is darkness lurking just outside the city walls though, and it pounces when they get far enough away from the safety of their home. 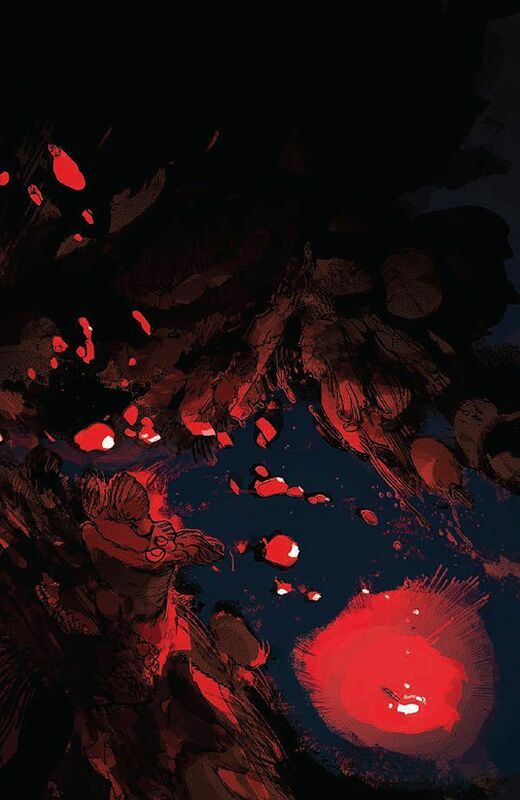 This tranquility is handled perfectly by Tocchini's artwork. The comic opens with a serene setting of post-coital bliss between Johl and Stel. Everything seems perfect in their lives. It's just another day and they're happily married. In mere hours their world will be shattered. Going back and re-reading these pages frames the story in a different light. Unlike most post-apocalyptic stories, the world of Low doesn't look rundown and dystopian. The city seems like a burgeoning metropolis filled with life. Humanity may have been driven underwater, but it took its technology with them. Nothing represents this more than the helm suit of Salus. This is a gorgeous suit of armor used to hunt deep within the oceans. It's presented in an angelic way, arms open, and wings (or I guess flippers?) spreading from its back. Every time it appears on the page, your eye is immediately drawn to it. Low showcases a glimmer of hope in a desperate world. With humanity sitting on a ticking clock, some have found the means to enjoy life while they can. Johl and Stel are about to lose those means. Now we'll see the lengths they'll go to get them back.